RTS Missions has been our Haiti partner for the past six years. Durign that time, we've partnered with them to provide a medical clinic, build (or at least build a part of) several churches and schools, ministered to hundreds of Haitian children and so much more. The relationships we've built with RTS Missions and their founding family the Shepherd family (Greg, Maria, and their son Caleb) have been amazing. We truly know each other. Over the past weeks, RTS Missions has been given a peice of property that includes a school with over 450 kids currently enrolled. That gift, which is an amazing blessing, comes with a lot of added costs. It also comes with tremendous opportunity to do more of God's work in Haiti. Right now, they're hoping to raise $15,000 in end of year giving to be able to fix their perimiter wall around the new facility, repair their main gate, pave an entry to the new property and more! Plus, additional funds are needed to construct new buildings, purcahse vehicles and sponsor children. Below is a list of ways you can pray and provide for RTS Missions. In 2019, we will be sending two trips to work with Greg at RTS Missions. In March, our trip will be providing water-filters to families who would otherwise not have access to clean drinking water. These water-filters can clean up to 150 gallons of water each day for 10 years! Our team will be spending time teaching families how to use and maintain the filters to last their entire lifespan. The filters are just $40 if we purchase them ahead of time & pack them to bring with us. We will take as many as we can! The March team has already formed and will be taking 12 missionaries for this work. Our second trip will be in July (20-27th) and we'll be doing a construction project and working with children. If you're interested in going in July, watch for an information meeting to be held near the end of March. Find out more about going on March 2018 Haiti trip! 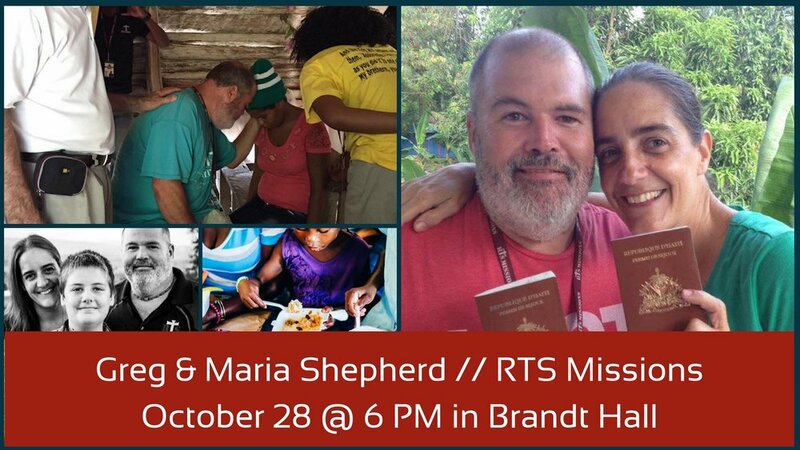 Our misisonary partners in Haiti, Greg and Maria Shepherd of RTS Missions, will be visiting Christ Church at the end of October. Greg, Maria and their son, Caleb, are full-time missionaries living in the Lascahobas area of Haiti. In addition to their full-time missions work, they've taken and led countless misisons trips of all sorts in Haiti. God has truly blessed the nation of Haiti through the willingness of Greg and Maria to not only go, but to go and go and go and stay in Haiti in full time. We have had the opportunity to travel to Haiti and send missionaries in partnership with RTS Missions and we had already booked two trips with RTS Missions in 2018. Through our partnership, we've helped build several schools and churches, we've facilitated VBS, provided work-glasses (reading glasses) and provided some basic medical care, all to share the Good News of Christ. Because of the long-term relationships Greg and Maria have built through RTS Missions, those schools and churches are reaching the people of Haiti, young and old, with the Gospel of Christ. In July and August alone RTS Missions helped 49 people receive Christ's salvation through their faithful ministry of the Gospel. Greg & Maria are faithful servants of Christ and conduits of God's love. We are so excited to host Greg and Maria for this one-night only even on Saturday, October 28th, 6:00 PM at Christ Church. With an engagement in Tennessee the following day, this will be your only chance to hear from them during this trip. Mark your calendars for this amazing opportunity, it's a big deal for us to get the privledge to Greg & Maria for this event and we can't wait for everyone at Christ Church to get to meet them.